New formal driveway and porte cochere on southwest side of renovated Seward Park home. 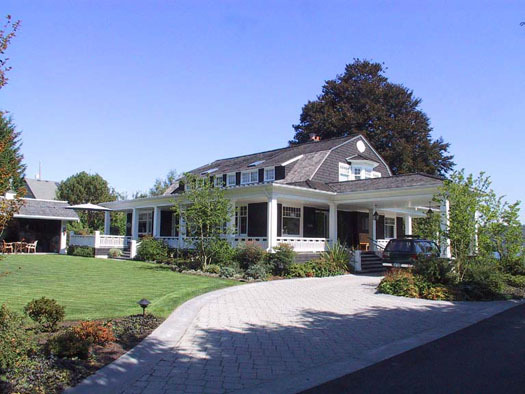 Renovate and expand a Seward Park home and enhance its architectural character while remaining true to the existing Dutch gambrel style. 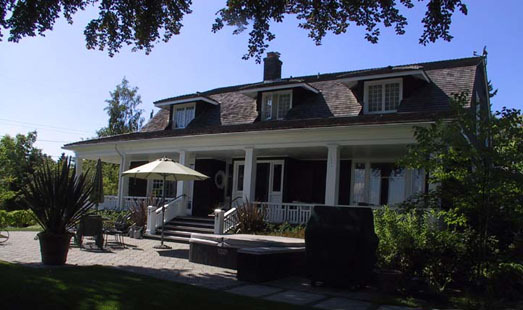 The house had undergone several remodels over the years but had never been added on to. 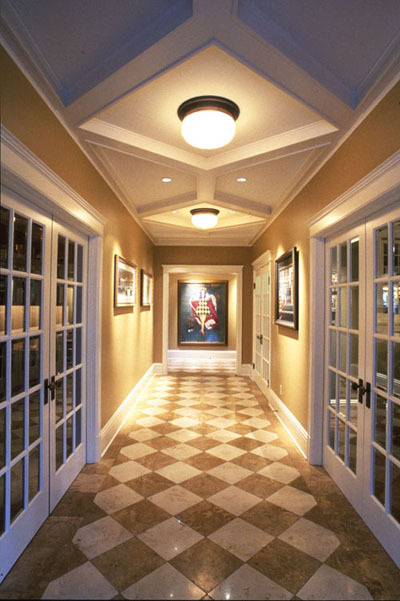 Create a porte cochere and formal entrance with a dramatic interior entry. On the main level, add two new home offices and a family room. On the upper level, add a master suite. 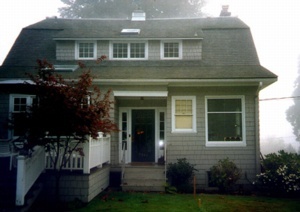 The original Seward Park home before the addition and renovation. The facade seen here was extended and now has part of a wrap-around porch (see the photo above, to the left of the porte cochere). Blended new work into the existing structure so that it looks as if it was never remodeled. Extended the existing covered porch on the east side of the house — a favorite outside space — to wrap the house on three sides and provide an attachement point for a new porte cochere. This formal driveway and entry enhances the clarity of the approach to the house and gives it a stronger identity. The existing entry remained as a secondary entrance. Created a wide hall as a new entry space into the house from the porte cochere. It serves as a place to greet guests and as an art gallery. The detail of the trim and ceiling are in character with the style of the period. Added two offices on the main floor, each tailored to the user and unique in style, size and appointments. 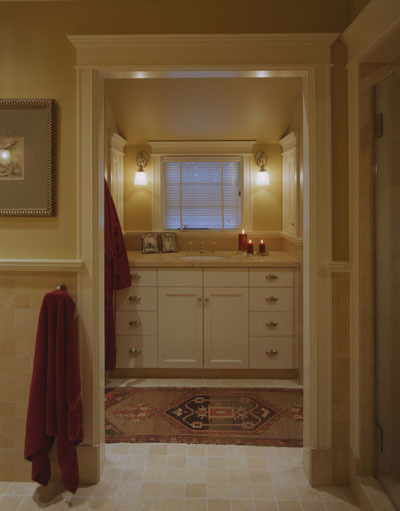 A new powder room is richly appointed in limestone and includes a large walk-in shower. The shower was added so that one of the offices could serve as a guest bedroom. Built a family room right off of the entry. Its intimate parlor setting makes it a great place to visit with friends or just relax. Laid out a new master bedroom suite upstairs, large enough to support oversized furnishings. The master bath has some unusual features, such as a sink in front of a window instead of a mirror. The east side of the house, showing the original porch that has now been wrapped around the south and west sides. 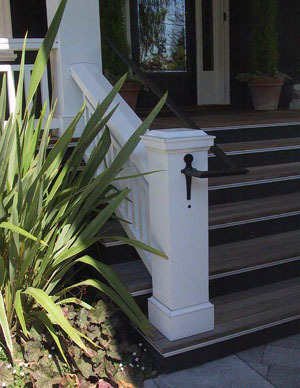 Detail of the stair post and handrail. 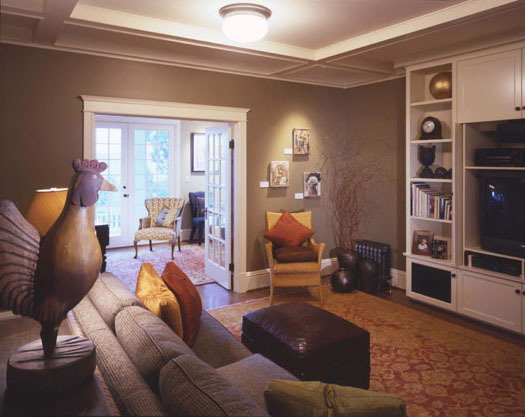 New formal entry hall that also serves as an art gallery. New family room off of the formal entry hall, with a view of the second office through the doorway. Upstairs master bath with sink in front of a window.